Blackberry-maker Research In Motion just can't catch a break. A week ago, a report claimed the BlackBerry was finally less popular than Apple's iPhone in RIM's home and native land of Canada. 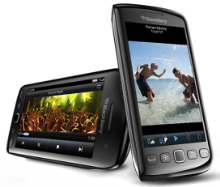 Then, on Thursday, RIM reported a terrible financial quarter posting a net loss of $125 million and a 21 percent decline in BlackBerry sales compared to the previous quarter. Things are so bad, RIM says it is going to give up publishing its own earnings forecasts altogether. That might be a good thing since, as AllThingsD points out, the company has fallen short of earnings expectations five times in a row. RIM's prospects seem dire and many critics are wondering if this latest earnings call foretells the inevitable doom for the once mighty BlackBerry. But other critics cite a few positive factors that could help the company rebound and regain some of the ground it has lost to the iPhone and Android smartphones. But RIM-watchers agree on one thing: the company has precious little time left to turn things around. Here's a look at what RIM has going for it and its biggest challenges, based on criticisms from around the Web. For all the strides Google and Apple have made with how their devices handle calls, texts, and e-mail, RIM's BlackBerry is still acknowledged as the best messaging device you can get. Even though smartphones are more about Angry Birds, Facebook, and Instagram but not SMS and voice calls, some people still want to use their handsets primarily as phones. "There still isn’t a better e-mail/messaging device than a BlackBerry. I would go back to a BlackBerry in a hot second if they had a similar feature set as an Android device," says TechCrunch's Matt Burns. But there's the sticking point. For RIM to win back users, it must offer touch devices that are on par with Android and iOS, and that includes a healthy native app ecosystem. An Android app player just won't cut it for the long term. When Thorsten Heins took over as RIM's CEO in January, many worried the new RIM chief was just as clueless as his predecessors. At the time, Heins claimed that RIM had reached "total new heights," apparently ignoring the company's sliding market share in North America and dwindling bottom line. But Heins was sober on Thursday during the company's quarterly earnings call, saying that "substantial change was needed." With Heins coming to grips with reality, RIM could start heading in the right direction. This "might be remembered as the moment when things started to get better [for RIM] rather than just another grim chapter in a once-mighty company’s slow decline," says Time's Harry McCracken. During its earnings call Thursday, RIM revealed it shipped 500,000 PlayBook tablets during its most recent quarter, bringing its total tablet user base to more than one million. But that's nothing compared to the iPad. Apple recently sold three million slates during the launch weekend for the third-generation iPad. "RIM sold as many BlackBerry PlayBooks over an entire three-month period as Apple sold iPads by lunch time on the recent launch day of the third-generation model," my colleague Tony Bradley says. Technology companies are increasingly moving toward ecosystems that include a variety of devices that sync to the cloud and are tied to vast app store catalogs. For BlackBerry to regain some lost ground, RIM needs to convince more users to take up the PlayBook as well as BlackBerry smartphones. Luckily, the company still has some time to make a big splash in the tablet market. Not a single Android tablet is mounting a significant challenge to the iPad, and slates running Microsoft's touch-friendly Windows 8 aren't due out until the end of 2012 or early 2013. That gives RIM some time without any new competition to convince more users to opt for the PlayBook. RIM's tablet recently received a signficant software upgrade including the addition of e-mail, calendar, and contacts apps. Despite reports to the contrary, RIM says it is not abandoning the consumer market, but merely refocusing on its core strengths, namely its enterprise user base. That may seem like a sound idea, but RIM shouldn't forget that smartphones are not just for work anymore. In fact, it may not be long before the smartphone completely replaces the feature phone, at least in the U.S. A recent Nielsen report said that as of February almost half of U.S. mobile subscribers owned smartphones, a 38 percent increase over the year prior. There's little doubt the consumer smartphone market is big and getting bigger. "At a time when smartphone sales are still booming across the world, RIM is seeing its sales decline and its market share erode," says Motley Fool's Eric Bleeker. That may be the biggest problem RIM has to straighten out, but can refocusing on the enterprise help bolster BlackBerry's popularity compared to the non-business market? Perhaps the biggest asset RIM has going for it right now is something that no one has really seen outside the company, BlackBerry 10. The next BlackBerry OS merges the company's traditional software with the QNX operating system acquired by the company in 2010 and currently used as a basis for the PlayBook. The interface for RIM's next OS is reportedly being developed by The Astonishing Tribe, another RIM acquisition and an admired user interface design company. Many RIM watchers and critics are curious to see if BlackBerry 10 will give the smartphone brand a much needed boost to better compete with Android and iOS. But if BlackBerry 10 misses the mark, that could be the last shot RIM has at relevance. "[RIM is]out of options. If BlackBerry 10 handsets are anything less than a smashing success, RIM will join Palm as the second casualty of the iPhone," argues GigaOm's Tom Krazit.